Home / On Television / AMC Fear Fest 2015 To Feature Friday The 13th Marathon! 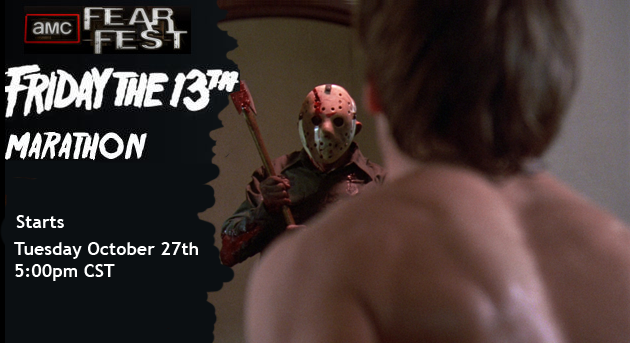 AMC Fear Fest 2015 To Feature Friday The 13th Marathon! Last year, during the month of October 2014, the AMC television network joined the Halloween festivities by holding the fourth ever marathon on the network for the film franchise during their two week run of Fear Fest. The annual Halloween Horror film festival Fear Fest features classic Horror films that fans can watch (edited for television). AMC received huge ratings during that two week time period once again last year and they look to dominate this season once again. You can't keep a good slasher franchise down, of course, as Fear Fest has begun to roll out it's programming schedule and it has been announced that a new Marathon of the Friday The 13th films will be run again this Halloween season! Although the full Fear Fest schedule has not been released yet, below is the tentative setup for the Friday The 13th films during the two day marathon event and beyond. All times are Central Standard Time in the United States.